Musing, sometimes optimistically, more often pessimistically, about the future of libraries seems to have appeal for many thinkers in and about the profession. Charles Ammi Cutter arguably started it with his late nineteenth-century vision, in some respects remarkably prescient, of a public library one hundred years ahead. From time to time, such musings take a detailed and scholarly form: Licklider’s Libraries of the future and Shuman’s Library of the Future and Beyond the Library of the Future are classic examples from earlier decades. 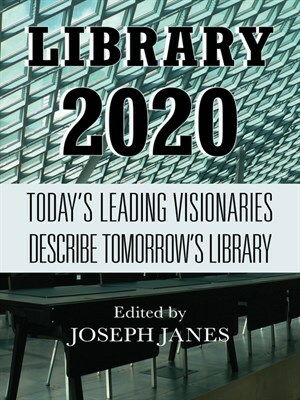 Library 2020, a new book edited by Joseph Janes of the Washington iSchool, is an interesting addition to this material. Janes assembles 23 chapter authors, with an additional contribution from himself, and get them to describe their vision for the library, specific or general, in 2020. The authors were asked, among other things, to be provocative, inspirational and not boring, and by and large they have followed these instructions. The contributors are largely practicing librarians and library educators, with a sprinkling of people from adjacent areas. Their contributions cover a wide spectrum of issues and views. Inevitably for a book of numerous short contributions, some will be more appealing than others to every reader, and it is likely that every reader will find something to interest them. If a single theme can be identified from such a variety of viewpoints, it is that touched on by many contributors, and expressed concisely by Kristin Fontichiaro: “libraries can no longer count on describing themselves as the repositories for stuff”. And many contributions reflect on what an alternative purpose may be. 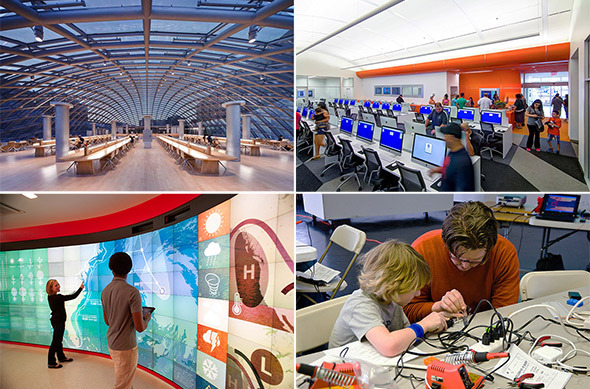 Fontichiaro suggests that libraries should be “places that host experiences”, and this is supported by others, with the currently very trendy makerspaces getting considerable mention. The Annoyed Librarian adds talks, workshops, and exhibitions, sensibly – to my mind – reminding us that libraries will still be primarily cultural centres, rather than general community hubs. Some contributors, again sensibly in my view, remind us that libraries will still be about information and resources, focusing on providing, as Janes says, a high-quality personal service. Elisabeth Jones emphasizes the continuing role of libraries in safeguarding and augmenting information access, and making materials findable. And, in a splendidly succinct and insightful chapter, Peter Morville writes of the library as “the one place you can go for truth … an act of inspiration architecture … [a] wonderful and wacky intertwingularity [sic] of information and architecture”. The same issues are addressed in a less wordy and more visual form in an article in the Slate web magazine on What will become of the library? ; how it will evolve as the world goes digital. The author, Michael Agresta, starts from the current travails of some libraries in the USA, categorizing the situation of many public libraries as providing three main services: storage of under-used collections of paper books; desktop computers for the dwindling number of those without other Internet access; and a warm place for the homeless. The article touches on many alternatives, including the inviting spaces – maker, cultural and community – analysed in more detail by the contributors to Janes’ book. What the future is for the library, and particularly the public library, time will tell, but there are more than enough positive ideas here to generate at least a little optimism.